In Shanghai’s Natural History Museum there exists a full-sized re-creation of an African plain, complete with a herd of spooked zebras in perpetual flight from a crouching lion. It was neither the zebras, nor the two large taxidermy elephants across the crowded walkway, however, that caught my attention. Toward the right-hand wall stood a tall tree crowded with monkeys. They were not the only things that rested within the branches; settled atop one of the tree’s largest boughs was a wireless modem. A quick glance around the room suggested that this modem, providing free wifi to the patrons of Shanghai’s museum, was as important to visitors as the painstakingly created exhibit itself. While small children reached out their hands to touch manufactured grasses and model animals, and some visitors snapped away with digital cameras in an effort to capture their journey into a landscape both they and I are unlikely to ever experience firsthand, a startlingly large portion of museum-goers kept their eyes on the screens of their phones as they partook of the fruits provided by the wifi tree. While standing in front of that man-made reproduction of a supposedly wild and untouched environment, a question posed to me three days earlier came rushing back: how do we talk about human transformation of the Earth? How do we do this in China in particular, which, with its 1,375 million people, is by far the most populated nation in the planet? Perhaps I should explain why I was in China in the first place. 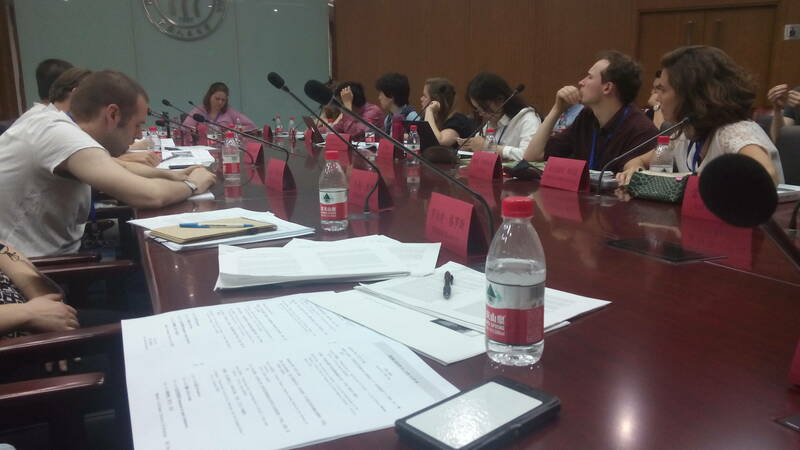 On May 21, I arrived in Beijing to attend the Transformations of the Earth Graduate Student Workshop hosted by both the Rachel Carson Center for Environment and Society and Renmin University Center for Ecological History. Along with twenty-three other graduate students, I had come to discuss how the Earth had and was changing as a result of human activity. We did this in paper workshops facilitated by the conference’s five mentors: Donald Worster; Christof Mauch, who serves as Director of the Rachel Carson Center and Professor Chair in American Culture and Transatlantic Relations at Ludwig Maximilian University in Munich; Professor Lise Sedrez of the Federal University of Rio De Janerio’s Institute of History; and Professors Hou Shen and Xia Mingfang, both of Renmin University’s History Department. It was on the first night of the conference that these questions were laid at my feet. Over the next several days, I was to hear many answers. Professor Lise Sedrez leads one of the the conference’s four discussion panels. Photo: Annka Liepold. Environmental historian Donald Worster, who has over the past few years split his time and energy serving as Professor Emeritus in the University of Kansas’s History Department and as Honorary Director of Renmin University’s Ecological History Center, kicked off the conference with a presentation on a subject that neatly matched how I felt after the two ten-hour plane rides I had taken to reach Beijing: crap. In his keynote speech, titled “The Good Mulch,” Worster asked the audience to think about how human waste (and by this, Worster meant actual human waste rather than garbage in general) had and continued to transform our environment. Using a stunning number of synonyms for excrement, he extolled the many ways in which it represented both a noxious byproduct of human activity and an opportunity for agricultural sustainability. This opportunity was, and continues to be, better availed of in China than the United States, as around 7,500 tons of human waste-derived nitrogen still make it on to fields yearly. (According to Worster, one ton of waste generates only about 12 pounds of nitrogen, meaning the production of 7,500 tons requires a whole lot of poop.) In reminding us to pay closer attention to the materiality of our environment, he called our attention to how even going to the bathroom, an activity most of us prefer to spend as little time as possible thinking about, can lead to huge environmental changes. In the case of crap, our need for healthy environments and uncontaminated food and drink leads to the development of modern sewage systems and massive water consumption. On the other hand, properly handled feces have for centuries provided us with the opportunity to return lost nutrients to the soil, acting as a virtually free source of sustainable fertilizer. Worster’s keynote flirted with two concepts that would shape the following two days of the conference: the Anthropocene and sustainability. Many in the environmental humanities, including Professor Rob Nixon, have written insightfully about the Anthropocene, an era in which human activities are said to have a significant impact on the environment. Springing from this basic concept came many of the conference participants’ most creative papers. In an inventive paper, Martin Meiske of the Rachel Carson Center explored the premise that large geoengineering projects like the Panama Canal heralded the Anthropocene. Robert Gross of the University of Klagenfurt, Austria provided a different take on the subject, explaining how Austrian ski resort owners forever changed the face of the Alps via the ski lift. Many papers touched upon the idea of the Anthropocene, leading naturally to the question of whether the word “Anthropocene” will become an enduring descriptor of environmental change or prove to be little more than a trendy term. Conference mentors Donald Worster, Hou Shen, Christof Mauch, and Xia Mingfang (white shirt) at the opening ceremony. Photo: Annka Liepold. Like the Anthropocene, the second theme of sustainability appeared frequently within the papers of conference members. Some, like Namrata Borkotoky of the Indian Institute of Technology, Guwahati and Andrew Gerhart of Stanford University, focused on issues of sustainability in regard to specific commodities. Borkotoky looked at how tea plantation owners in 19th and 20th century Assam struggled to avoid nutrient depletion within their fields, while Gerhart discussed the effects of disease within the Chilean salmon industry, alluding to the potential biological agents have for threatening world food supplies. Several presenters also focused on the issue of sustainability in our host country, China. Cheng Yaoyao of Renmin University discussed how the residents of Houjiaying Village in Heibei Province battled environmental constraints including dwindling water supplies and declining soil conditions in the attempt to sustain the local sorghum industry. On the other hand, Liu Mengfei of Tsinghua University touched upon the issue of sustainability in her paper detailing how multiple modernization projects attempted to keep alive the oft-sluggish and shallow Tsinghua River that ran through her campus. While the Anthropocene lent itself to more clear definitions, Worster and his fellow mentors challenged conference participants to define the word sustainability. Almost all of our papers grappled in one way or another with issues of sustainability, yet few stopped to interrogate what sustainability might actually look like. Although the word “sustainability” suggests proper use of one’s environment and the protection of resources into the future, it proved much harder to define exactly how sustainability is best achieved. Our idea of how long or how much of an area’s resources need to be preserved for an activity to be labeled sustainable surely differed as well. As Worster pointed out, our ideas about sustainability functioned much like our ideas of justice. Each of us has an internal sense of how justice is best served, just as each of us forms our own notions concerning sustainability. The trick, and the writer’s task, lies in making these individual notions clear to each other by engaging openly in the conversation concerning what sustainability has meant in the past and might mean for our future. Days later, I found myself contemplating the future as I watched the crowds pass through the African exhibit. One the one hand, the Anthropocene seems to warn of a future in which humans might only experience the safari as I saw it then: a realistic yet entirely fabricated display of what once had been. The creation of sustainable societies offers a tempting counter-narrative to this declensionist (and admittedly, by now, clichéd) version of what the Anthropocene threatens to create. Perhaps we will learn to temper our appetites for growth and utilize our living spaces and resources more wisely. With a bit of thought and effort, we might have our wifi and tree full of monkeys, too. Bailey Albrecht is a PhD student in the History Department at Center for Culture, History, and Environment (CHE).